Experience Bermuda from Shore to Sea. Join a select group of high school students for a once-in-a-lifetime adventure investigating Bermuda’s marine environment at BIOS while learning offshore sailing and navigation, and experiencing the Sargasso Sea on board Bermuda’s 112 ft. national tall ship, Spirit of Bermuda. Led by experienced staff and instructors, this unique joint shore to sea field course gives participants the experience of a sail-training program that infuses a global science perspective with both cultural and historical elements. No sailing experience is required. Eight professional crew provide instruction on basic sailing skills, navigation techniques and safety. Take the helm of the Spirit of Bermuda and, along with your team, explore aspects of the Sargasso Sea initially learned about at BIOS. Experiential learning at its best! With its small group size and high instructor to student ratio, this experiential education program is the ideal way to experience Bermuda from shore to sea! 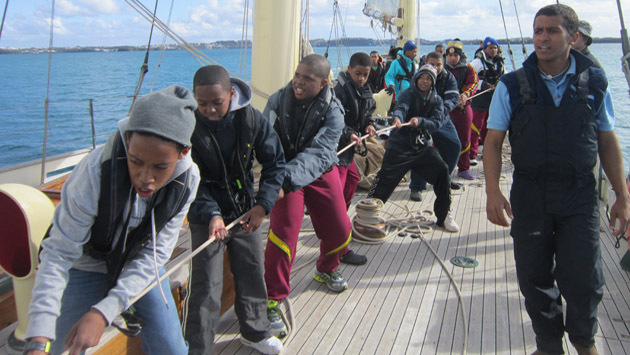 Bermuda Sloop Foundation provides superior character development to a large number of youth using the unique attributes of experiential learning through sail training in the dynamic, 24/7 operating, floating residential community and classroom: sail training vessel Spirit of Bermuda. Program available to students aged 15-18. Contact JP Skinner at jp.skinner@bios.edu to sign up. Visit www.bios.edu/education/bios-spirit-summer-trips/ to learn more.